Caption: (pic above) Wildcat athletes wear their future college sweatshirts. Seated, from left, are: Jane Reynolds, rowing; Conrad Crakes, sprint football; Mindy Pang, water polo; and Sabrina Vumbacco, swimming. 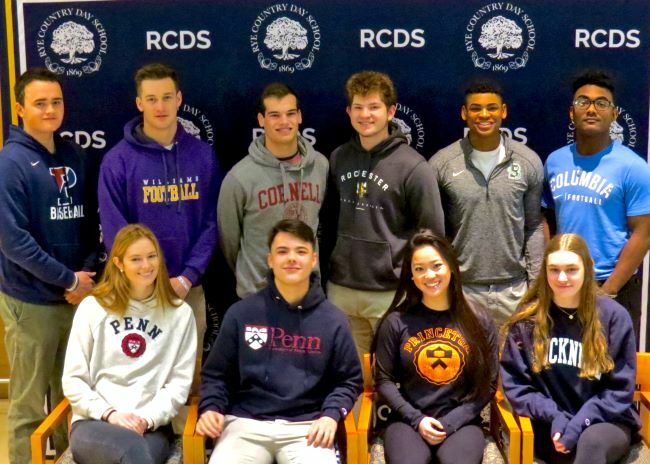 Standing, from left, are: Owen Coady, baseball; Nick Owens, football; Justin Mandell, sprint football; Franklin Hong, football; Allan Houston III, football; and Cameron Coleman, football. Not pictured is Malcolm Brydson, Union College, football. 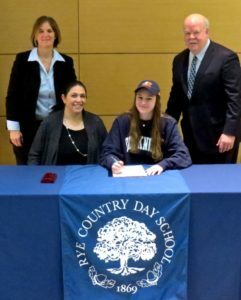 Caption: Swimmer Sabrina Vumbacco signs her Bucknell national letter of intent. Seated beside her is Associate Director of College Counseling Susan Davidson. Standing at left is Athletic Director Wendy Haft. Headmaster Scott Nelson is at right.